As an intermission between photos of what other people were wearing at Sunfest this year, I thought I'd show you the outfit I put together that was the most fun for me to wear. 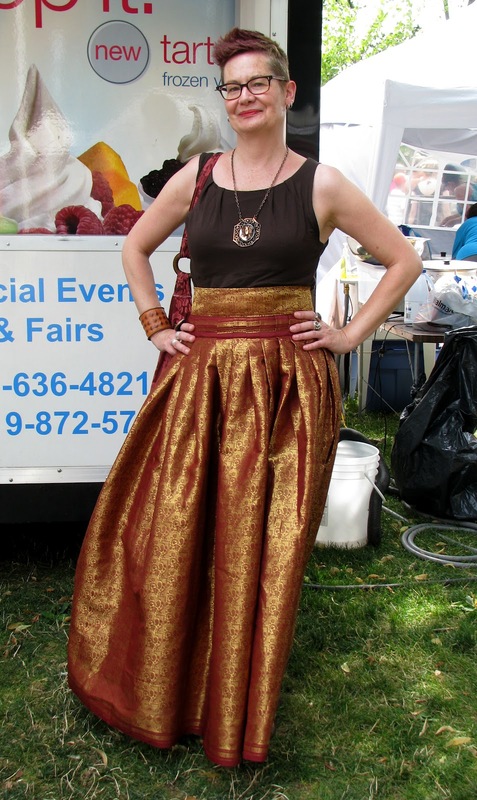 I got this fabulous skirt at The Sentimentalist and had been waiting to bring it out for Sunfest. It was handmade and I think the rose and gold fabric is silk. The temperature had dropped a few degrees and there was a lovely breeze the day I wore it which made the skirt billow like a sail. My favourite articles of clothing are those that inspire a narrative, and wearing this skirt made me feel like I should be standing on a windswept cliff, scanning the horizon for my lost love's ship. The scene from the film The French Lieutenant's Woman with Meryl Streep, scanning the horizon for her love's ship... Love that drama! Gorgeous skirt. Oh what a beautiful skirt. I'll bet you were a commanding presence. The skirt is simply divine! I love the color, the volume, the shimmery fabric, the high waistline and the smile that you have as you wear it. You must have had many admiring glances as you swept by. Fannnnntastic!!! A really special skirt and you accessorized it very well. You seem to have lots of luck at the Sentimentalist. Very great skirt. So sparkly so it's perfect for a sun fest. I hope you got a frozen yogurt after taking this photo. beautiful skirt - kaunista ! This is a stunner skirt Shelley, beautiful color!